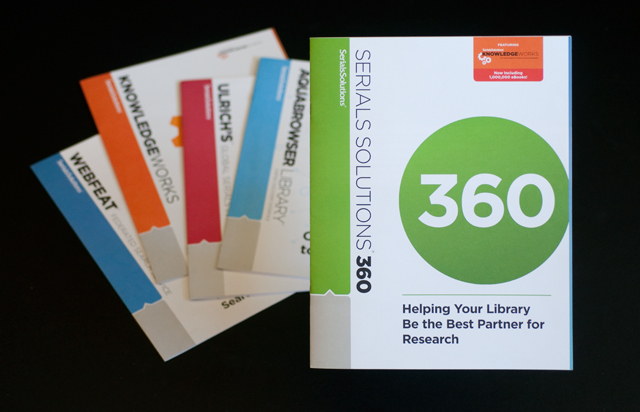 Serials Solutions, a subsidiary of Proquest and a leader in the realm of library software solutions, has been rapidly expanding their repertoire of solutions and acquiring new companies along the way. With each new product or acquisition they need to elegantly incorporate the new element into their brand family. We created a graphic approach and visual language that expands the Serials Solutions brand across multiple properties. We designed a comprehensive series of marketing materials, including booth graphics, infographics, product identity systems, and brochures. We continue to work with the client to address ongoing needs for expansion of the brand and product line.